When probing the collective behavior of populations of neurons, the typical asynchronous irregular spiking behavior of the individual neurons does not cancel out. On the contrary, the collective behavior produces very characteristic activity patterns. Do these patterns serve a particular purpose or do they simply reflect the network topology? Are they related to function, and why are they so different when we sleep or are anesthetized? The superficial electrical behavior of the brain has been measurable for ages, and the advances in brain imaging make them even more intriguing. 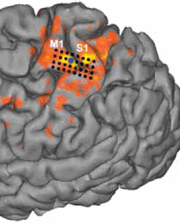 Even at the coarse resolution of fMRI signals we find consistent macro-scale statistical corellation patterns. What are these patterns trying to tell us? 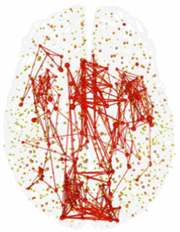 In this workshop five speakers will address the characteristics and the potential meaning of oscillations in electrical and haemodynamic brain signals. Walk from Utrecht Central Station into shopping mall Hoog Catharijne, take a right after 50m at ABN-AMRO. Walk past the Albert Heijn, and leave the mall at exit 'Moreelsepark'. Go left, cross Catharijnesingel, continue for 150m on Mariaplaats, follow the right turn and find Grand Café Carré on the left hand side. Inside Café Carré there is a white door that hides the stairway to the Poort van Kleef meeting center.